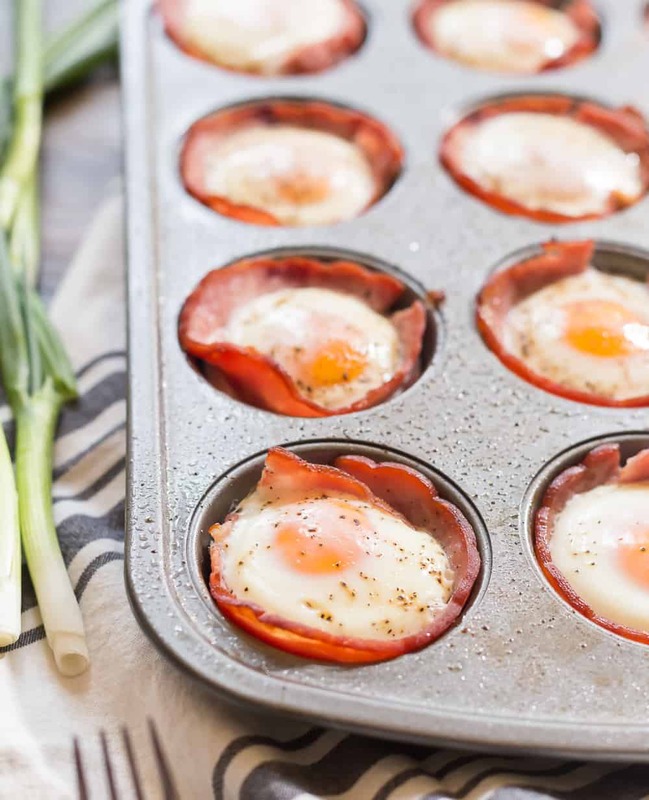 These ham and egg cups are an easy low carb breakfast ( or keto breakfast ) that are perfect for meal prep, or a healthy brunch recipe that can easily be made ahead! Anyone else still trying to shed a few lbs before sweaters turn into swimsuits this year?? I’ve been steadily cutting back on my carbs for years ( within reason, of course ), and I’ve found that a healthy breakfast has been the hardest part for me, when it comes to eating lower carb. It’s like I wake up READY to cram a croissant down my gullet. So I started becoming really desperate for an easy low carb breakfast recipe that I could make ahead on a Sunday and enjoy with brunch, then reheat throughout the week without feeling heavy and weighed down by the time my 9 AM meetings roll around. For me, “easy” means “as hands off as possible”, and nothing is quite as easy as throwing something in the oven to work its baking magic. But how do I bake eggs? The Muffin Tin was the answer. I just knew it. That perfect size, those little wells just perfect for ham and egg cups … my muffin pan, formerly a bastion of carby baked goods, was about to be pushed out of its modus operandi. This plagued me. Making eggs is one of those things that seems like it should be so simple, but it really isn’t. 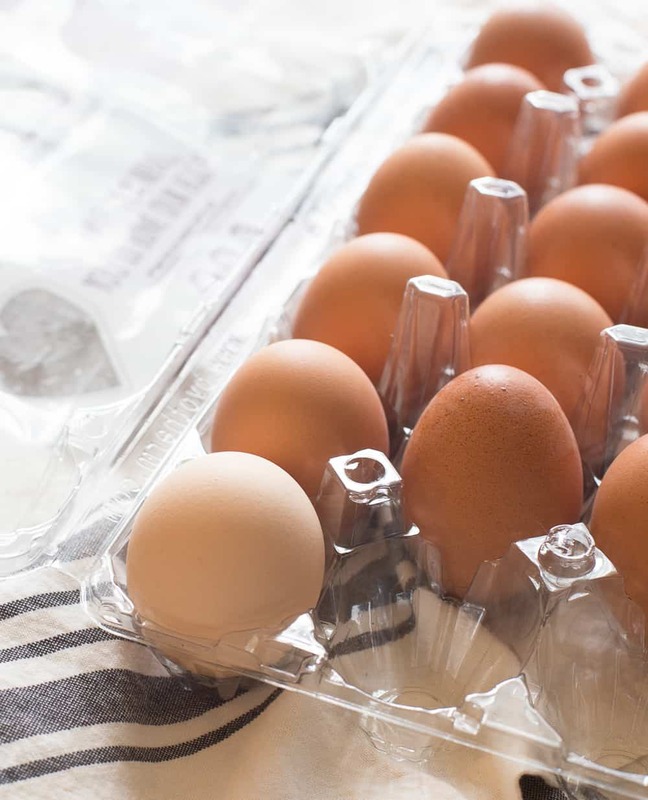 Getting that perfect ooey, gooey runny center or that jammy yolk or that perfectly hard boiled egg can be a matter of minutes or less of cook time! 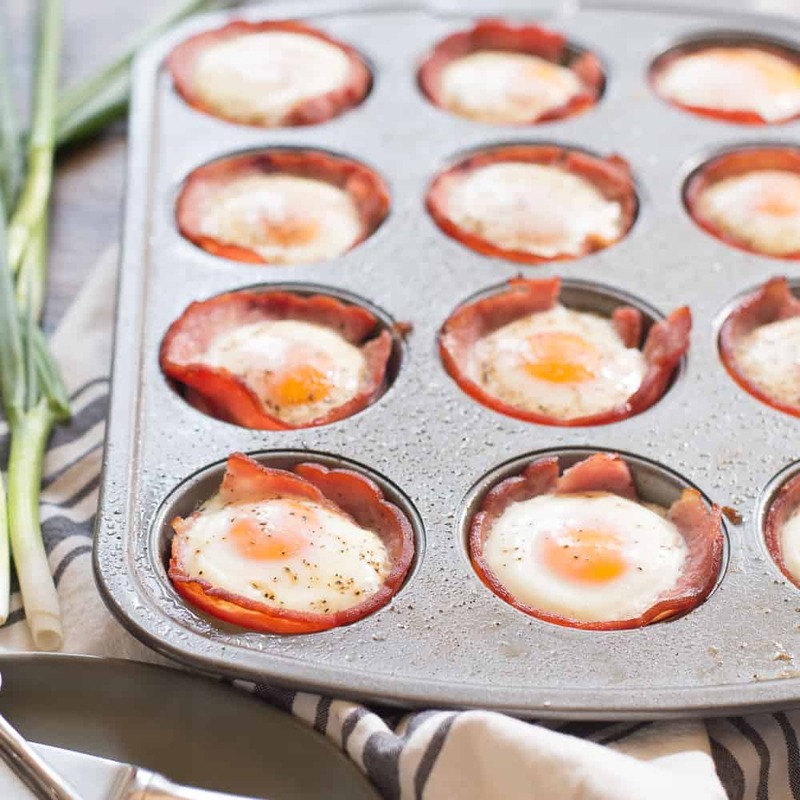 Cooking eggs in a muffin pan makes one part of that simple: shape! 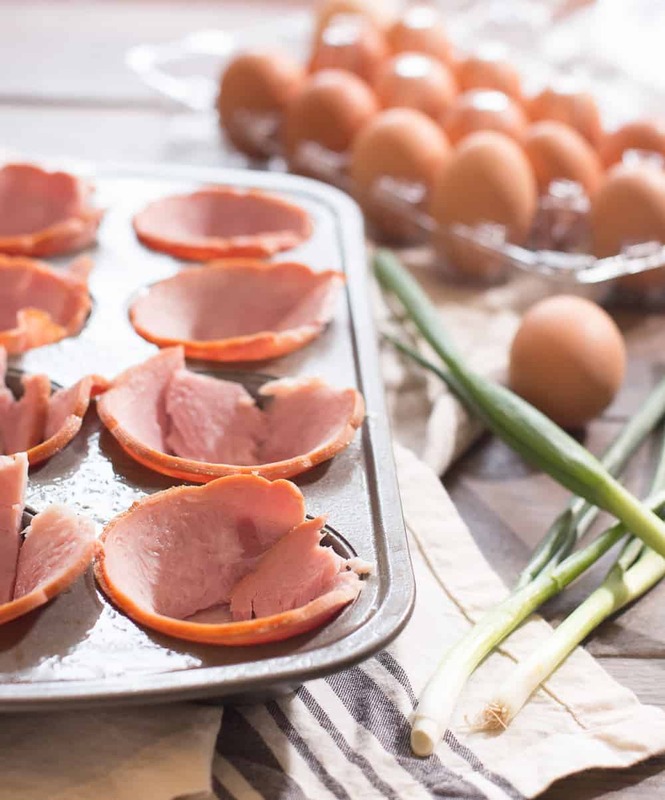 Cooking ham and egg cups in the muffin tin takes care of another issue: sticking, as the ham creates a perfect barrier between pan and egg. The pan still needs to be greased in some way to catch any of the eggy bits that escape the ham cup ( there will be some ), but for the most part, your ham and egg cups will pop right out of the muffin tin when they are done baking. Runny whites: Keep cooking. Ain’t nobody want runny whites. Rock hard hockey pucks with a green ring around them: longer than 20 minutes. Please don’t do this and then blame me. The perfect keto, low carb breakfast on the go: Ham and Egg cups cooked in a muffin tin. 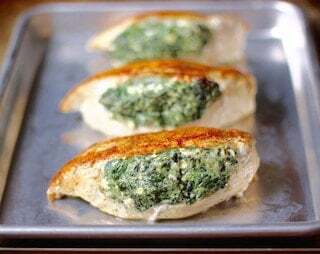 Makes breakfast for a crowd or healthy meal prep breakfast easy! Preheat the oven to 400 F. Generously spray a muffin pan with cooking spray. Line each individual muffin well with a piece of ham. I tore each piece of ham a flap the size of the base of the muffin well, so that I could put him in the bottom and wrap the sides of the ham piece more easily around. If the ham does not completely cover the well, add another piece to make up the gap! 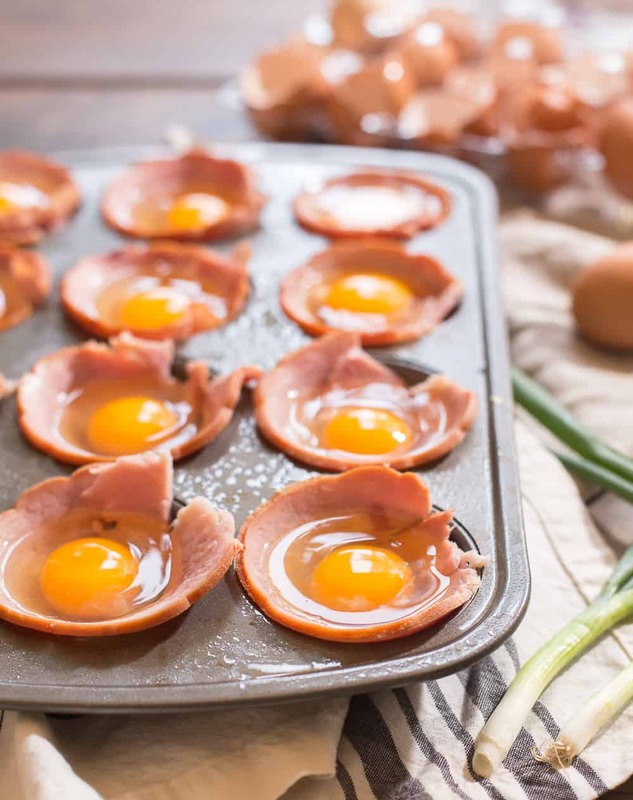 Once all muffin wells are lined with ham, crack an egg into each well. Salt and pepper each egg / ham combo. 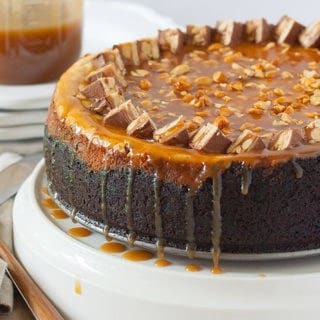 Place the pan into the oven. Cook time can vary a lot based on how your oven runs, but for me it was 14 minutes for runny yolks, 15 minutes for jammy yolks, and 17 minutes for fully cooked through hard-boiled style yolks. Please refer to the post above for more information on cooking time!